The Galapagos Islands are a wonderful place to visit, but inevitably increasing numbers of tourists, and a growing resident population, are placing the delicate ecosystem under new pressures. As part of our series of reports from the Galapagos, the Blue Planet Odyssey sailors reflected on this in their own personal blogs, while also recognising the great work that scientists, teachers and park officials are now doing to mitigate these threats. Only 2% of all of the land on the Galapagos islands are owned privately. The remaining 98% are owned by the government marine wildlife park. The government strictly regulates the tourist trade by only allowing the small cruise ships to sail between the islands and conduct tours. The ships can hold a maximum of 100 people with a requirement of 8 guides per boat. It’s their way of keeping a tight enforcement of roaming tourists all over the island. As a cruiser owning our own boat, it is frustrating because they put so many requirements on us before entering the islands but they allow 10-12 cruise boats to stop every day and bring in their huge amounts of trash and dump their waste. We are not allowed to cruise between the islands and have to either visit via a tour or with a guide. I do have to commend the government for enforcing the trash separation of their organics, waste and recyclables. The Galapagos people really are trying to keep their islands pristine by eliminating all trash that would often times end up in the ocean such as in the San Blas islands. With the enactment of its 2008 Constitution, Ecuador became the first country in the world to codify the Rights of Nature. 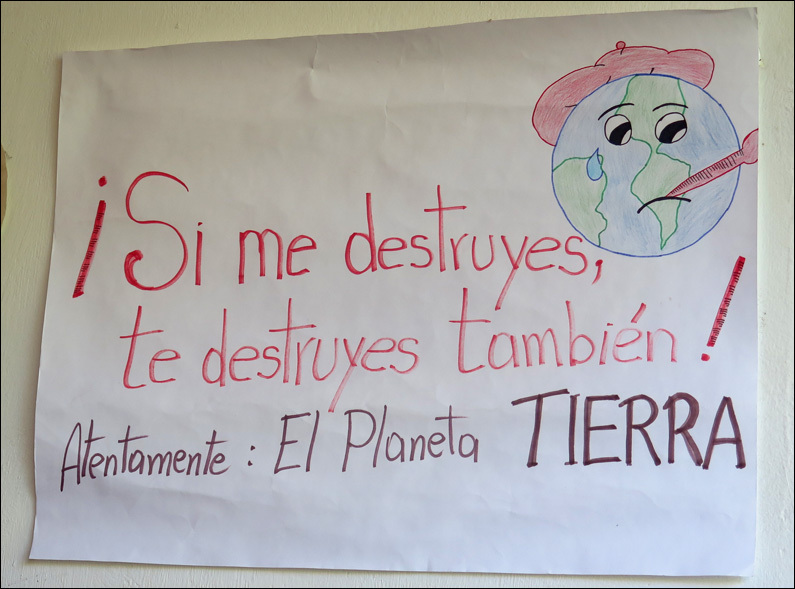 Articles 10 and 71–74 of the Ecuadorian Constitution recognize the inalienable rights of ecosystems to exist and flourish, gives people the authority to petition on the behalf of ecosystems, and requires the government to remedy violations of these rights. At anchor we were blasted with the rather intense exhaust from nearby anchored cruise ships and oil slicks from their incomplete combustion. The Rights of Nature have been violated. Interesting dilemma, not really for us specifically as this is more a hygienic nuisance, but for the Galapagos in general. And they admit this in the National Park’s “Interpretation Center”. With so many tourists coming on ships and airplanes, all manner of challenges have evolved: acutely, lack of food and water for the tourists but much more critically for the local population plus increasing air-sullying assaults from the air and sea. And this is just a fraction of what is happening in Ecuadorian society which is fossil fuel rich with the need to balance extraction of this black gold replete with negative effects on ground water and the ozone layer with raising the level of the standard of living for its entrenched poor. However I sense, after a couple of conversations with Ecuadorians I am encouraged that their country is committed to social and economic equality all the while attentive to how that can be achieved without superceding the two degree threshold that climate change specialists peg as the tipping point. There are ever-increasing numbers of visitors (and residents) here. How do you enable them to experience the wonders without destroying the wonders? 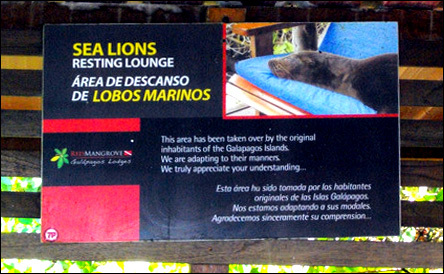 The Galapagos administration is clearly making a huge effort to preserve the ecosystem. The animals and the environment appear to be largely unaffected by the visitors. But one can no longer explore and discover on one’s own. And more restrictions will likely be needed as more airplanes, more cruise ships, and, yes, more yachts, bring added pressure to bear. As some have quipped, the most destructive invasive species here is human! How do you preserve the exceptionally-unique wildlife, environmental, and local resources on some of the most historically isolated islands in the world when presented with basic resource challenges, such as water and food supply, while your chief source of income is tourism? 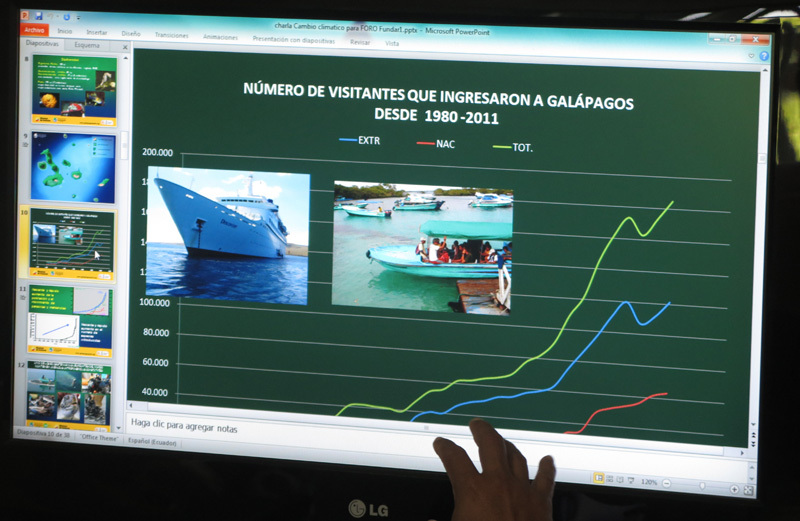 The Galapagos and its people struggle with these challenges and seem to try desperately to strike a balance. With an increasing population of over 25,000 and over 150,000 tourists per year, issues such as sewage treatment and the introduction of invasive organisms and species require constant monitoring and care. Which also happens to be why we were required to sign a form that said the cat could not leave the boat! The Galapagos has faced problems with cats, dogs, and a rampant goat population eating or destroying endemic wildlife here. UNESCO and the World Heritage Society have visited the islands and informed its leaders they are failing to protect the environment. A result has been an influx of international funding and dedicated efforts through the addition of multiple scientific monitoring and education programs. Local schools provide an entire textbook for students specifically dedicated to protecting their special place. Tourism businesses have been placed under strict environmental rules. Obtaining cruising permits in these islands has become expensive and difficult. We fear this will eventually become impossible and feel privileged to have visited the Galapagos before these challenges escalate. Water and fuel must be obtained through scheduled visits by certain provider vessels, and trash must be separated into recycling, organic materials, and basic trash. 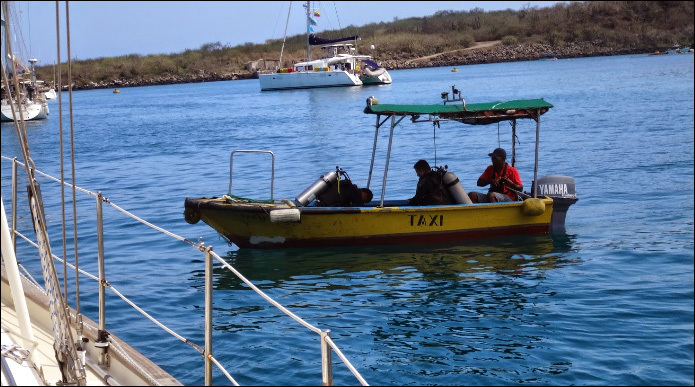 We are not permitted to deposit any form of foreign organic materials ashore, and all septic tanks aboard have been checked to make sure we are not pumping overboard. We are more than happy to accommodate. But to give you an idea, small private boats are the least of their concerns. With a population of over 25,000 and annual tourism of over 150,00 visitors, the culture of the Galapagos strikes a balance between lively village life and protected natural resources. That being said, the people of the Galapagos are warm, welcoming, and express awareness of their situation.